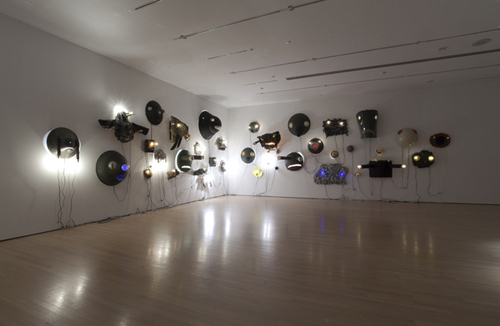 Jon Pylypchuk, The War, 2009, mixed media, dimensions variable. Royal Art Lodge alumnus Jon Pylypchuk has the imagination of a delinquent, in league with so many of his North American contemporaries and unmistakably influenced by punk and DIY culture. This survey of recent efforts (dating from 2006–2009, with the exception of an early video work) demonstrates the profundities of his approach, despite its apparent puerility. In particular, two major works—The War, 2009, and press a weight through life and I will watch this crush you, 2006—testify to Pylypchuk’s ability to work on a large scale, with mature, mythic themes. The primitivist The War consists of dozens of anthropomorphic masks. It immediately summons non-European art idioms: Several jutting eyes suggest African death masks, and Haida totems also spring to mind. Yet Pylypchuk’s creations cannot be worn—they are mounted to the wall, and many have glowing lightbulb eyes—and his “war,” arguably in the tradition of Western outsider art, is strongly internal. The materials, used ingeniously (they include a packing blanket, couch cushions, and a lot of polyurethane foam and epoxy resin), imply a kind of rec-room pantheism. Commissioned for the opening of Detroit’s Museum of Contemporary Art, press a weight… is a ramshackle ecosystem of the cartoonishly abject. Essentially a shantytown, the work is installed on the ground next to The War, whose masks act like heavenly bodies in contrast. While hardly social realism, Pylypchuk’s vision, with its puppet derelicts and Merzbau-like dwellings, is an affecting ode to the misfit—in aesthetics, history, and life.